Travel between Zagreb and Ljubljana has become very popular in recent times as tourist numbers have increased in the region. There are so many things to do in Zagreb and with Ljubljana only being a 2-hour drive from Zagreb, it's the perfect place to visit. Whether it be a transfer from Zagreb to Ljubljana or a Day trip from Zagreb to Ljubljana or Lake Bled, Octopus Transfers Croatia can assist you with getting there. A private transfer from Zagreb to Ljubljana or Ljubljana to Zagreb is the most efficient and comfortable way to travel between these capital cities. A Zagreb to Ljubljana private transfer will take you a little under 2 hours and is a pleasant drive along the motorway. With many travellers basing themselves in Zagreb they prefer to take a private day trip from Zagreb to Ljubljana. 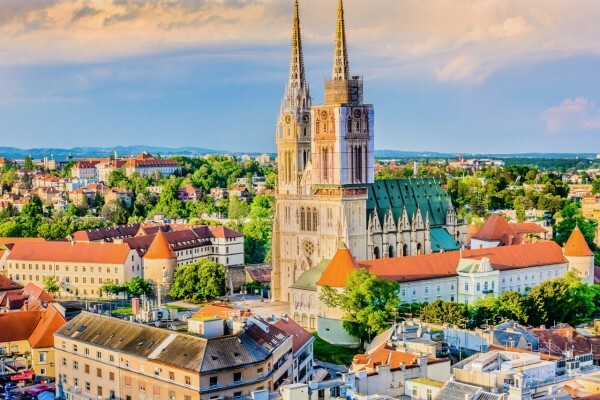 Taking a Zagreb to Ljubljana day trip means your driver picks you up from your accommodation in our comfy vehicle, and you make your way to Ljubljana in style and more importantly avoid those crowded buses. Upon arrival, your driver will drop you off in the centre of Ljubljana and then wait for you while you explore the beautiful city. He will then collect you at the agreed time and you make your way back to Zagreb. Some guests even like to include a visit to the stunning Lake Bled making it a Lake Bled day trip. If you would like a guided tour this can also be arranged for an additional cost. Put simply, this is the best way to visit Slovenia from Zagreb as you are in control of when you depart Zagreb and how much time you spend in Ljubljana. If you are looking for a Zagreb to Ljubljana taxi transfer look no further, then Octopus Transfers Croatia. We are number 1 on TripAdvisor, have the most competitive price for a private transfer from Zagreb to Ljubljana. Providing our guests with the best service possible is our top priority. As such, all our Drivers are English speaking professional Drivers; our vehicles have Wi-Fi so you can stay connected and we offer complimentary water in our vehicles. Most importantly we look after your safety and will ensure you have a comfortable ride. All you need to do is sit back, relax and let Octopus Transfers Croatia take the wheel and we will get you from Zagreb to Ljubljana in style. Prices for a transfer from Zagreb to Ljubljana start from €140 and we have sedans, station wagons, minivans and minibuses ready to take you anywhere across the Balkans. You can Check out our prices at www.octopustransferscroatia.com or contact us at info@octopustransfers.com for a free quote.